In the previous post with our first hands on experience with the new G-Blade miners we have mentioned a bit the topic about voltmodding the new Blade Miners. Now is the time to talk a bit more about it and share our experience based on the voltmod experiments we have already done on our G-Blade. We already said that the new G-Blade uses the same UPI Semiconductor UP1509 chip for controlling the voltage of the GC3355 chips as is used on the smaller 5-chip ASICs. So it is easy to do the voltage modification to the G-Blade as you are going to be essentially replacing the same resistor, though there is a bit of a difference in how things look on the new PCB. There are no element markings, so make sure you replace the right resistor marked on the photo above with a green circle with the 333 written on it. The resistor we are replacing is also a 33 kOhm one (~1.2V default), though here it is 603 type and not 402 like on the 5-chip ASIC devices, so it is easier to replace. Do not be in a hurry to solder a new one before reading our advice. Since the default voltage of the GC3355 chips is 1.2V as on the smaller 5-chip ASIC miners here you can pretty much expect the same out of the box performance, though our tests have shown about 800 MHz to be the safest option in terms of how high you can go with no or very minimal HW errors, so a bit lower results than what we are seeing on the 5-chip ASICs. Also since the voltage regulators used on the new G-Blade are not that much powerful than the ones used in the 5-chip models you are not going to have the same safe headroom to increase the operating voltage of the chips, in fact you are actually pretty limited. 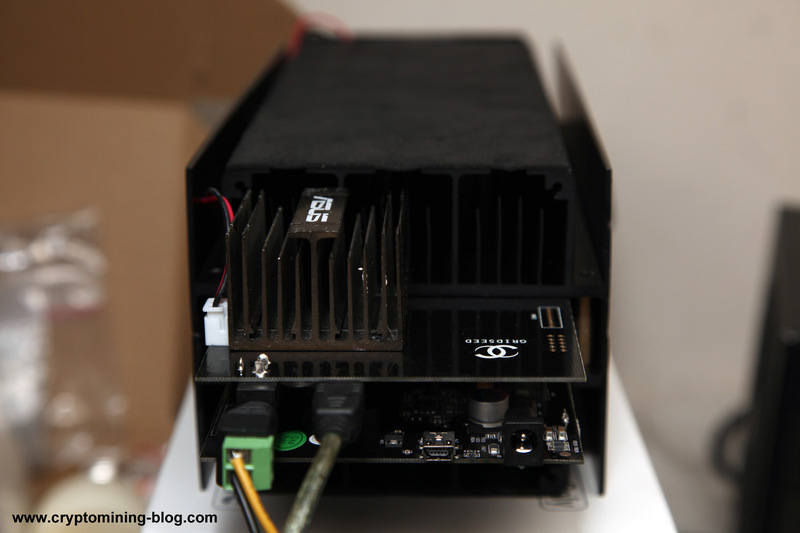 We were quite disappointed in how Gridseed has designed the cooling of the new G-Blade miners, and especially the use of a powerful and noisy fan to compensate for the lack of adequate cooling for the three VRMs. The CG3355 chips can easily be cooled with a silent and much lower RPM fan, however it seems that the powerful fan is there just to be able to ensure that the mosfets are kept cooler without having any radiators directly placed on them or on the back of the PCB where they are located. We are getting about 60 degrees temperatures of the IR mosfets at the standard voltage and operating frequency of 800 MHz, however as soon as we remove the fan the temperature of the VRMs starts to get higher very quickly while the CG3355 chips still remain pretty cool. 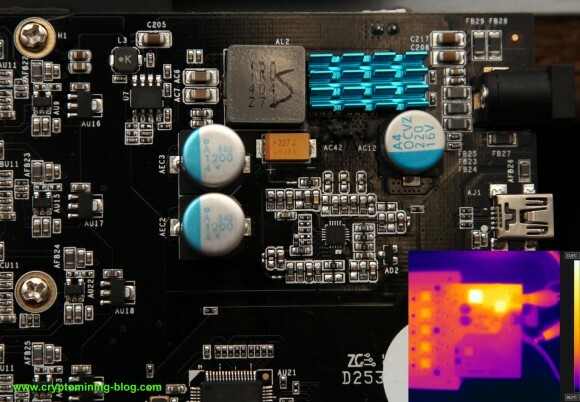 By replacing the resistor marked above with a higher value one and increasing the operating voltage of the chips you can easily overload the voltage regulators and burn them in a matter of just a second without the fan and even with the fan running you can still burn them if they get too hot. So the moment you decide to voltmod the new Gridseed G-Blade you need to also think of improving the cooling of the voltage regulators a lot and not try to push the operating voltage of the chips too much, or you risk the VRMs easily overheating and burning up. We have used an old motherboard chipset radiator glued on the back of the PCB (with thermal glue) where the voltage regulators are placed, so that it can help in keeping them cool and have also placed a smaller video memory cooler directly on top of the regulators on the other side of the PCB. We have slowly started increasing the operating voltage of the chips from the standard value of about 1.2V until we have reached 1.4V with the use of a 39 kOhm resistor and decided to stop there as we’ve already seen the voltage regulators getting quite hot. At this point we were aiming at a stable operating frequency of about 1000 MHz while keeping the device cooler and being on the safe side for the voltage regulators. With the 39 kOhm resistor replacing the standard 33 kOhm one we already saw the mosfets easily getting up to 90-100 degrees Celsius in about a minute (without the extra cooling). With our extra 2 radiators attached to the PCB and the chips we were able to bring the temperature below 70-75 degrees on the long run, so pretty much safe for leaving the miners run all the time like that, though you should continue to carefully monitor the temperatures. We have decided to stay at 39 kOhm, though pushing a bit more for like 40-41-42 kOhm with extra cooling might work, going for 47 or 49 kOhm may be a bit too much for the VRMs to handle. So be extra careful should you decide to go higher tan what we have used, though we do not recommend it, and monitor carefully the temperature of the voltage regulators as they may get very hot in no time and burn up without adequate cooling! Here is what we are getting after replacing the resistor from the standard value of 33 kOhm to a 39 kOhm one. Running the device (only one of the PCBs is connected on the photo) at 1000 MHz seemed quite Ok with little HW errors, though we have decided to go a step lower in order to lower the HW errors a bit more. After some additional testing we have settled for 988 MHz as it brings down the HW errors up to something about 1-2 per hour which is much more acceptable than getting an error about every minute or so at 1000 MHz. The local hashrate at 988 MHz we are getting per PCB is close to 3.4 MHS or almost 6.8 MHS total for the whole miner with the 2 PCBs modified, up from about 2.6-2.8 MHS per board or about 5.2-5.6 MHS without the mod and the miner running at 800 MHz. The power usage per PCB after the voltage modification is about 85W or a total power consumption of about 170W for the whole modified miner. 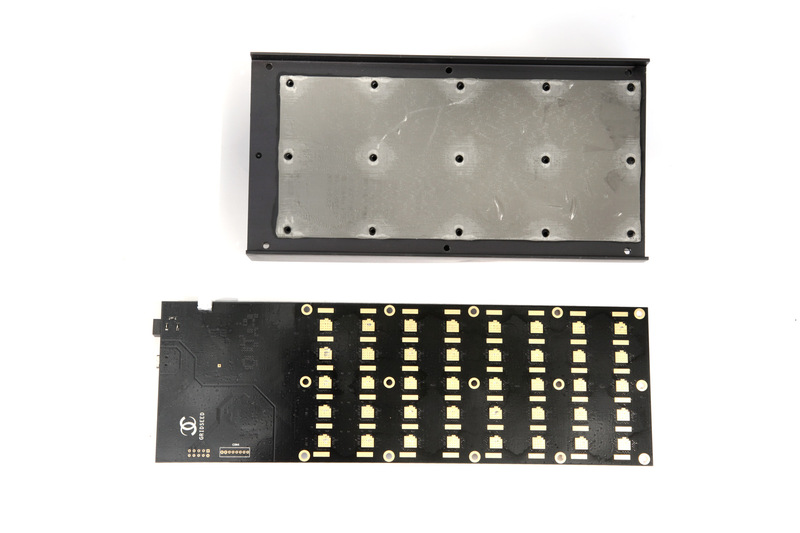 The results we are getting are not bad, but do require you not only to solder a resistor, but also to improve cooling of the device. You also need to be extra careful should you decide do go even higher than what we have achieved as the voltage regulators might not be able to handle well the additional load or the temperature. It seems that with the G-Blades things were already pushed close to their limits by Gridseed, so there is not that much of headroom left for users to squeeze some extra performance for free by voltmodding the units. We are a bit disappointed by that, we kind of expected more, especially after seeing what the GC3355 chips were capable of in the smaller 5-chip devices. We are going to be doing some more tests and experiments in the next few days to see if we can get something better than what we are already getting, but the chances for some significant improvement are not that good. Again we advise anyone willing to do a voltage modification to his Gridseed G-Blade ASIC miner to be extra careful as these devices are more expensive and can handle less abuse from the users as compared to the smaller 5-chip ASIC miners, so proceed with caution! 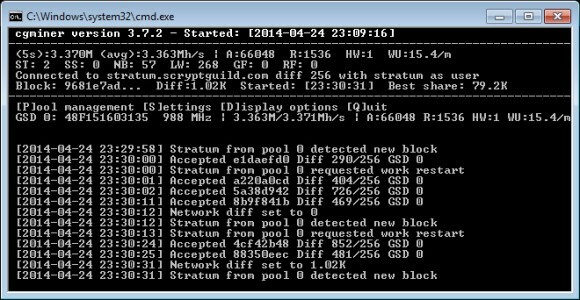 The smaller 5-chip miners allowed more headroom as they were designed to handle much higher power usage because of the BTC mining part, but for the new G-Blade miners Gridseed has decided not to support the SHA-256 mining part (the chips do, but the device cannot supply enough power, so do not try to activate BTC mining or your miner may burn). So the headroom for overclocking without doing some modification related to the voltage regulators is actually very little with the new G-Blade ASIC devices, and working only on improving their cooling does help only a bit. 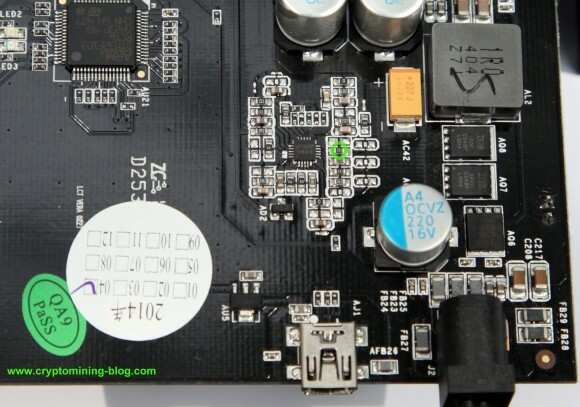 Reworking the power part of the miner could open up some additional possibilities, but that is not something that most users can easily do themselves unlike the replacement of a single resistor for example. In short, if you are expecting performance boost on the bigger G-Blades like on the smaller 5-chip devices with a voltmod, you will be very disappointed, and the fact that after voltmodding the Blade Miner you might have trouble cooling it down properly for long term operation might not be worth the extra performance boost you will get. 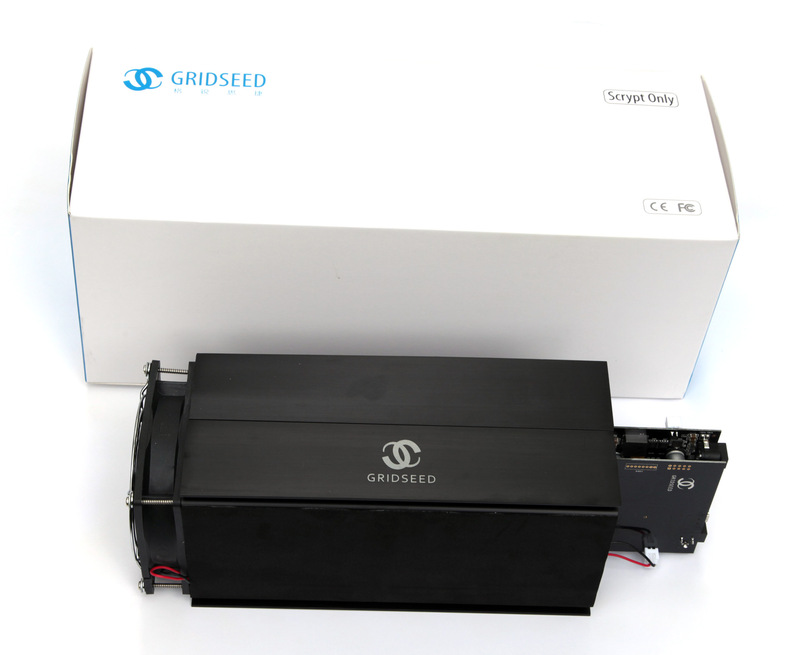 Not long ago when Gridseed has announced the new 80-chip Blade Miner with an expected retail price of about $3000 USD we were not planning to buy any of these devices, but at the new $1600 USD price we have decided to order one and play with it. We just got our unit yesterday and have been playing with it since, so we are ready to share our first hands on experience with the new G-Blades. Soon after the announcement of the new Blade Miners we were able to do some remote testing of the performance, so you might want to check that out first if you still haven’t read the post. Now, that we finally have the device in our hands we can say it performs pretty much the same as we’ve seen from our tests. Starting with our first impressions, the new G-Blade Miner is a bit smaller than we have expected it to be, but that is not a problem. 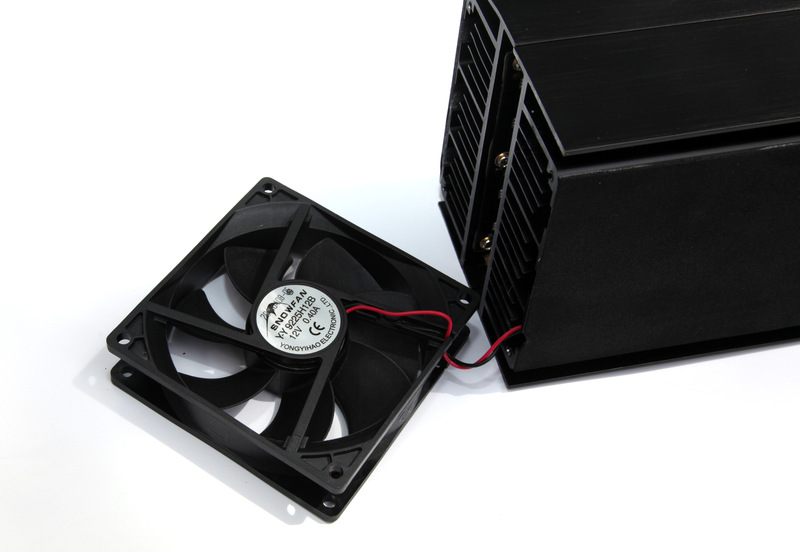 The thing that we did not like very much is the noisy fan – a 92mm fan is being used and a quite powerful one that can produce up to about 55 dB. The cooling radiators however do seem very cool after 24 hours running the device, so the fan does its job perfectly fine, however we suspect that with a quieter fan we could have achieved the good cooling performance and much quieter operation. The fan is directly powered by 12V from of the PCBs of the miner, so there is no temperature based control for example and it runs at maximum RPM all of the time. 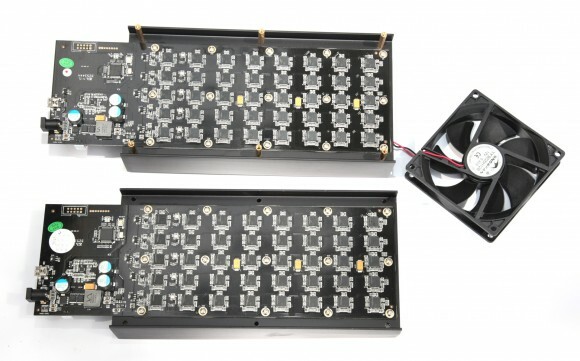 A single Gridseed G-Blade ASIC Miner consists of 2 PCBs that are attached into a single device, each of the PCBs has 40 GC3355 chips and has separate power and control logic built in. So essentially you get two separate miners each with 40 chips packaged in a single device. Do note that the cooling radiators are at the back of the PCB and not directly on top of the chips, this is the easier way to do things, especially if the chips don’t get too hot, as you use the back of the PCB as a cooler as well. 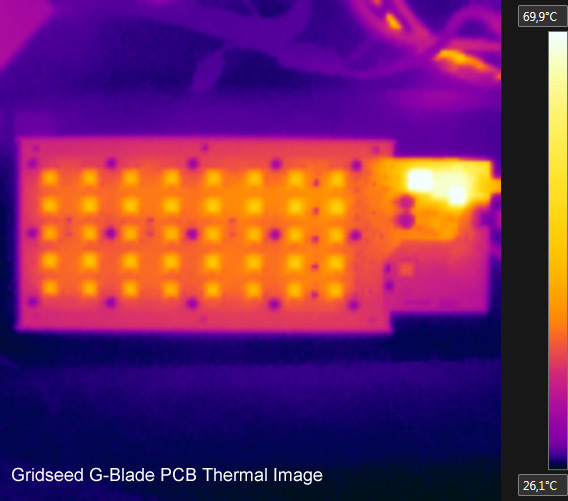 There is a thermal pad between the PCB and the radiator on the back and apparently with the powerful fan there are absolutely no problems for cooling the Gridseed GC3355 chips. Now, the actual problem is with the parts of the PCB that is not covered by the radiator – the place where the power and control chips are located as well as the connectors for the power supply and the USB port for control of the miner. 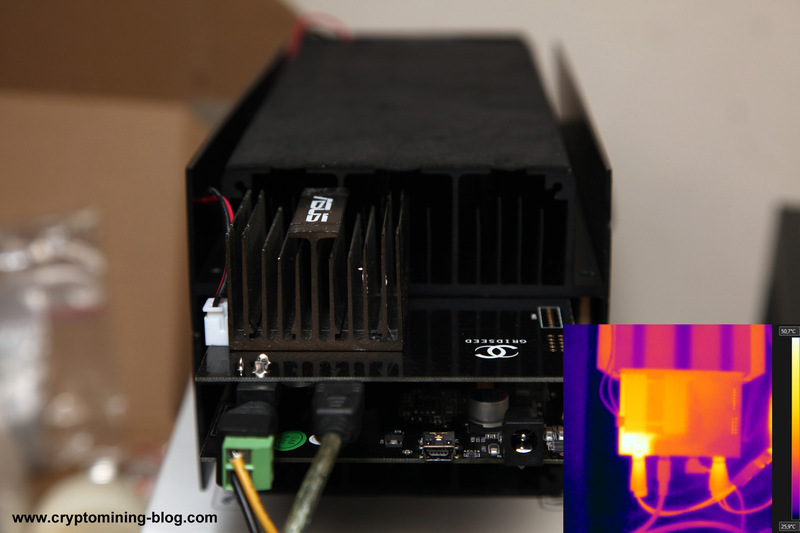 The weakest point in terms of cooling actually do seem to be the voltage regulators and the powerful fan is some kind of a not-so-good solution to address the issue with the VRMs getting quite hot without getting a serious airflow. Gridseed uses International Rectifier 5300 and 5302 power mosfets and while these are a bit better than the ones used on the 5-chip ASICs, they are not much more powerful to handle serious increase in the power consumption. In fact they are not capable of supporting the power consumption that the GC3355 chips would require if they are used in BTC mining mode, so that is why Gridseed does advertise the new miners only as Scrypt capable and warns users not to try to mine BTC with them. The good news for people that are interested in voltmodding these new G-Blade miners is that the voltage control part is again controlled by UPI Semiconductor UP1509 Single-Phase Synchronous-Rectified Buck Controller with 2-Bit VID Input control, just like on the smaller ASICs from Gridseed. 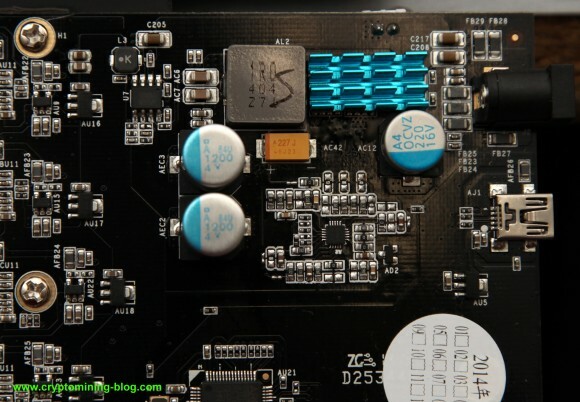 So you can easily increase the operating voltage by replacing a single resistor, however we do warn you to be extra careful in doing so, especially with higher value resistors as the voltage regulators will not be able to handle voltages as high as on the smaller ASIC miners. Another good news is that the resistor you need to replace here on the G-Blade is a 603 type and not the smaller 402 type used in the 5-chip ASIC devices, so you can have less trouble replacing it. We have already done a voltage mod to our G-Blade and are currently running tests on the device, so shortly we are going to publish a little more details about that, meanwhile we warn you not to be in a hurry to mod yours as you can very easily damage the device. And using a 47 or 49 kOhm resistor will most likely be a bit too much for the VRMs to handle and you can easily blow them up in a matter of seconds without the appropriate cooling or even with such!